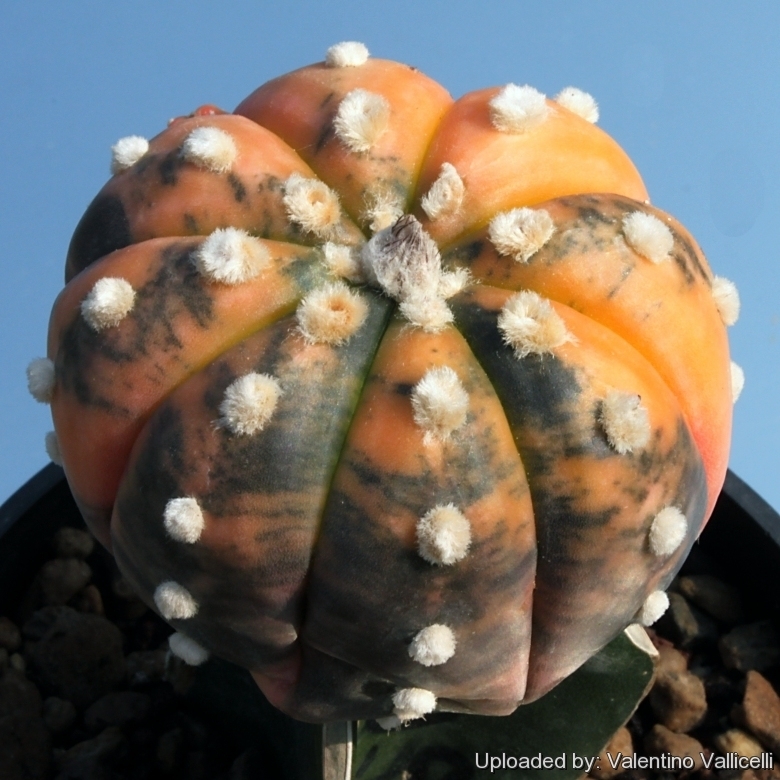 Description: The classical Astrophytum asterias var. nudum ( a.k.a. “Ruri Kabuto”) has a very characteristic glabrous green stem lacking the white tufts of loose hairy scales typical of the common Astrophytum asterias. The smooth green epidermis show up the felty areoles. The variegated cultivars “Ruri Kabuto Nisiki (Orange-Red)” has sectors, patches or stripes with distinct shades of orange. All variegates are mutants. Something has gone wrong with the cellular structure of the growth tip (apical meristem) of the plant. As a result of this mutation, chlorophyll is missing from some or all layers of the plant epidermis. The odd variegate appears in many seedling batches in a small percentage (especially among hybrid seeds) and are generally separated from normal plants. Variegated plants grow slower and are generally smaller than non-variegates of the same species. Coloured areas are also generally weaker, and more susceptible to fungus, sunburn and other defects. 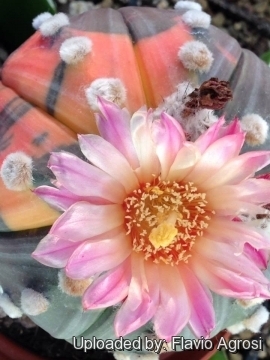 A large well grown variegate Astrophytum is truly an achievement. These are harder to grow well than they appear. Plants with variegated stems are often attractive and highly prized.